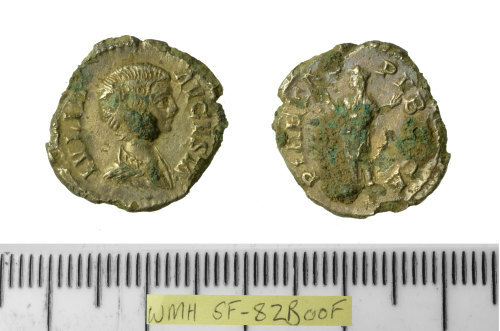 A silver plated copper alloy Roman contemporary copy of a denarius of Julia Domna, dating to the period c.AD 198-202 (Reece period 10). PIAETAS (sic) PVB[LI]CA reverse type, depicting Pietas standing by altar. Reverse description: Pietas standing front, head left, by altar, raising both hands.